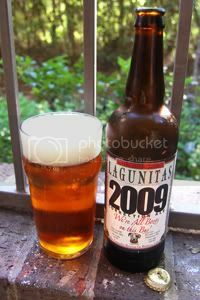 It's that time again, time to review another hoppy limited edition Lagunitas brew with a nebulous style and oddball name. Always an enjoyable, though perhaps not earth-shaking, experience, these beers are usually worth a try (or two). What we have here is 2009 Correction Ale, what the label claims that is is "NOT a Double IPA, just a good American Ale." I'm calling an American IPA based on it's vitals: 6.3& ABV and 74 IBUs. Alright... Well, let's crack the bottle and see what the beer is like. Appearance: A crystal-clear golden-amber body capped by two fingers of creamy off-white head that features good retention and lacing. Aroma: A blast of bright, floral, and mildly pungent hops with fruit character that ranges from citrus to pineapple. Underneath the hops is a somewhat meek pale malt base. Taste: True to the aroma—piney, citrusy, and mildly bitter hops over a toasty pale malt backbone. As you'd expect from an IPA, the balance is certainly tipped towards the hop side of the equation. A nicely bitter aftertaste that endures well. Mouthfeel: Medium bodied with good carbonation and some oiliness. Dries in the finish. Drinkability: A very sessionable IPA; the bomber disappeared rapidly. Verdict: Correction is certainly a tasty little IPA, and I could drink it all night long. I'd love to see this start showing up in six packs, rather than 22 ounce bombers. Note: While this review is being published in January, the tasting notes contained within were taken when the beer was fresh last June.